A Light and Sound Installation by Mischa Kuball at the Jewish Museum Berlin. can be visited from November 2017 until summer 2019. 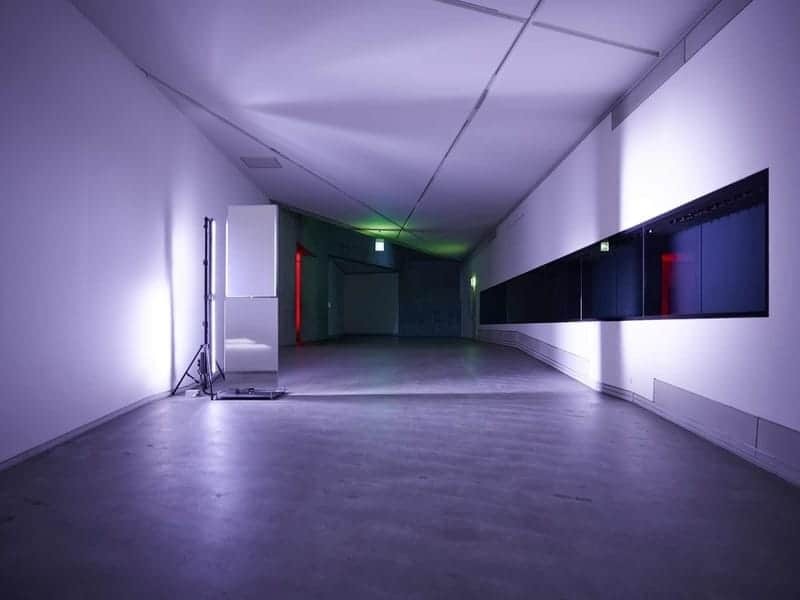 As an important element of the installation, several loudspeakers, distributed throughout the room, loop a series of 60-second-long sound clips – so-called Skits – which were composed specially for res·o·nant by more than 50 musicians. The contributing musicians include John Zorn, Roedelius, Jürgen Paape, Stabil Elite, Kreidler, Thomas Fehlmann, Heiner Goebbels, Frank Bretschneider, Emmanuel Witzthum, Monika Werkstatt, AGF, Barbara Morgenstern, Beate Bartel, Danielle de Picciotto, Gudrun Gut, Islaja, Lucrecia Dalt, Pilocka Krach, Sonae, Ihor Holubizky, Kurt Dahlke aka Pyrolator, Pamela Z, Dee C’rell, Michael Scheibenreiter, Eberhard Kranemann, Andrew Pekler, Robert Kolinsky, Florian Bocksrucker, Alessandro Gaia, Karl Felix Bionek, Marlon T.L. Fink, Thomas Klein, Lucas Croon, Kobermann aka Johannes Piller, Hans W Koch, Axel Heilhecker, Zafraan Ensemble, Minou Oram, BAR, Kurt Hentschläger, Odysseas Klissouras & Alexandros Kontogeorgakopoulos, Ascion, Alma Quartet, Michele Pedrazzi, Florian Scheibein, Söhnlein Brilliant, Alex Wirth, XAMBUCA, Yejin Gil, Tim Schumacher aka DJ Normal 4, Midori Hirano, Anja Penner, Luis Negron, Opera Factory Freiburg & Holst-Sinfonietta, Ross Downes, Cass. aka Niklas Rehme-Schlüter, Michal Zietara, Krzysztof Honowski, Hans Nieswandt, Ali Chakav. David Fenech composed an exclusive track for this event, that will be shown randomly in the exhibition space.